First Year of Production Rolex Oyster Waterproof Watch! Why This Watch Is Important – The First Generation Rolex Oyster Waterproof Watch! “Rolex did something truly astonishing in 1927: it released a genuinely waterproof wristwatch that, unlike earlier efforts from other firms, neither looked, or felt unusual and could be worn on a daily basis. The seasoned Rolex enthusiast may well recognise the model above as an early example of that historic game-changer: a first generation Rolex Oyster.” – So begins an excellent article entitled: The watch that changed everything: the 90th anniversary of the Rolex Oyster. The article is written by James Dowling, the recognised authority on vintage Rolex and author which may be read here. The design of the first Rolex Oyster watch case was nothing short of revolutionary. The construction of the Oyster case was quite complicated and very expensive to produce. The case is composed of four main parts: the main case with the lugs attached to it, a central ring and separate screw-down bezel and screw-down case-back. The movement and dial are held in a separate central ring with external threads at either end, which is secured to the main case by the bezel on one side and the case-back on the other. Two soft metal seals were also used, as shown in the diagram. The screw-down crown comprises of a further three parts. The first four Rolex Oysters were actually released in 1926 in an octagonal and a cushion-shaped case, 28mm for ladies and 32mm for men. The fractionally larger Octagonal Oyster was less popular than its curvaceous sister and was removed from the catalogue after a few years – which of course makes it the more desirable model among collectors today. Whilst waterproof, the Rolex Oyster at this time was not considered a dive watch as recreational diving did not exist at the time and military diving was still in its infancy. It was sold as giving peace of mind, not as an invitation to adventure under the sea – and its design reflected this. The soft curves of the octagonal’s Art Deco angles were something to be admired from across the dinner table, not on the back of a boat. The first generation Rolex Octagonal Oyster we have here is one of the finest examples we have seen. 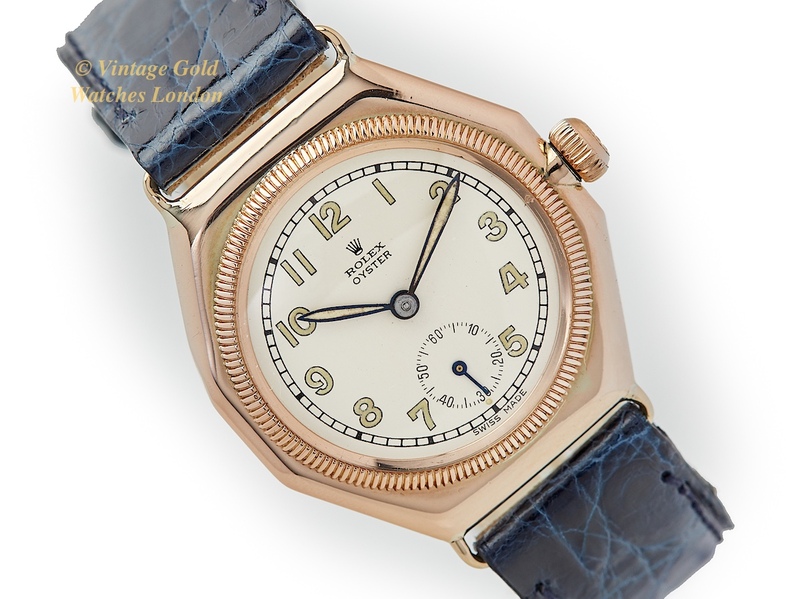 In very rare Pink Gold, the case is in breathtaking condition indicating this watch has led a particularly charmed life and/or seen little real use! For those unfamiliar with this early model, the case measures 33mm x 33mm, excluding the correct original Rolex Oyster screw-down crown. This may sound small until you consider the case measures 38.5mm corner to corner and 39mm in length excluding the lugs. The original large screw-down winding crown also adds another 4mm to the overall width of the case. The case is immaculate from every aspect. There are no scratches, dings or any other marks visible to the naked eye. Even the knurling is crisp and free of damage on the bezel and on the case-back. The finish on the case body and case-back looks like new! It is only when the inside of the screw-down case-back is revealed, are we reassured that this is a 90 plus-year-old watch. All the markings are perfectly correct and at the top, between the two Rolex signatures we have Glasgow UK hallmarks for 1927. For reasons of their own, Rolex hallmarked most, if not all, of their early Oyster cases in Glasgow during the 1920s. The text then claims 7 World Records! (for accuracy and reliability). There is also a British Patent number 260554 with the date the patent was registered in 1925 with the case number 21647. Each of these markings informs us this is a very early example of this watch from the first production release in 1926. It could perhaps be a pre-production example due to the early case number and the ‘7 World’s Records’ legend as Rolex was proclaiming ’20 World’s Records’ on its early 1927 Rolex Oysters. This movement, as exclaimed on the inside of the case-back, had already won 7 world records for accuracy at Kew, Geneva and Neuchatel Observatories by the time this watch was launched in 1926. So in addition to having the advantage of a waterproof, dustproof, and rust proof case, this made this a revolutionary wristwatch. This was in fact, the wristwatch which made the pocket watch obsolete in one stroke, from this moment forward. The Rolex Cal.10 1/2, 15 jewels, hand-wound movement has the ‘Extra Prima’ designation, which was more accurate than the standard ‘Prima’ version. As can be seen in the close-ups, this movement is in beautifully clean and sparkling condition with not even the slightest evidence of abuse or damage in the form of poor servicing or water ingress. The movement has received a full overhaul and service by our vintage Rolex specialist watchmaker and when tested on our electronic test machine following careful calibration, the watch movement was running at +10 seconds/day. This is outstanding for any vintage watch, let alone one of this age. We have also tested the watch to confirm it is running reliably and strongly and keeping good time, without any rewinding, during a 24 hour time period. We are confident that with continued proper care, this watch movement will run accurately and reliably for many more generations to come. We therefore have no hesitation in offering this watch for sale with 12 months warranty. However, while this watch was originally designed for daily use, due to its age and tip-top condition, we would recommend occasional use only. Please also note that the water resistance of this watch has not been tested and it is not guaranteed. We always recommend vintage watches should be kept clean and dry at all times. The dial here is also very special. Redolent of the later, ‘California’ style dial, including certain art-deco influences of the period, it is simple, charming and a much sought after design which we ourselves really love. The bold Arabic numerals would have originally been hand-painted with luminous radium infused paint. After a few years, these would have aged nicely to become the pale yellow colour you see here on this dial. However, due to the now commonly known hazards of wearing a radioactive wristwatch, the use of radium paint on watch dials has been banned now for many years. However, our dial restorers have done a wonderful job of recreating the colour and consistency of the paint to faithfully represent the look of the dial, now in perfectly restored condition. Similarly, the wonderful, original ‘Sword’ hands have beautifully restored in the correct shade of yellow to match the dial. This is the original dial which has been superbly restored by our vintage watch dial restorers, considered the best in the U.K. The strap fitted is a new high quality water-resistant ‘Croc’ leather strap in Dark Brown, with a Rolex pink gold plated buckle. We feel this nicely matches the watch, however, if a different style or colour or style of strap is preferred, please let us know and we will do our best to oblige, free of any extra charge. We carry tan, conker, dark brown burgundy and black in stock, in plain padded leather, alligator, crocodile skin or lizard skin. Although there is no original paperwork with this watch, the reference numbers, markings, signatures, and hallmarks all match and are correct for this watch, dating it to circa 1926. Detailed particulars will be included with the purchase receipt, along with our 12 months’ warranty*. A separate insurance valuation for the replacement value will be provided at the time of sale along with our ‘Lifetime Authenticity Guarantee’ which states: “If this watch proves to be anything less than totally authentic, or not as described, Vintage Gold Watches of London will offer you a full refund at any time”. The watch also comes complete with the Rolex purse shown in the photographs. We have here a beautiful and highly collectable vintage gold watch from horology’s most famous name, which will provide an excellent financial investment as well as be something to treasure and enjoy! A truly top class example of one of the earliest Rolex Oyster watches, ready to wear and practical for occasional use which if treated with care, will make an excellent investment or family heirloom piece. Even though vintage gold Rolex prices have risen markedly in the past 12 months, we still feel great examples such as this are undervalued, because as each year goes by, the world market for vintage gold Rolex watches is expanding almost exponentially and so we think prices are destined to climb ever higher in the foreseeable future. A word on our prices – We always try our hardest to acquire the very highest quality watches we can find, before then restoring them to the highest possible standards. We then offer these at the fairest prices we can, taking into account our pre and post sales care and service. This approach means we will never be the cheapest, but nor will we be the most expensive. Indeed there are some well-known stores in West London which are highly successful charging between two to three times the price you see here. We therefore consider our prices to be very fair, given the quality of watches we have to offer.